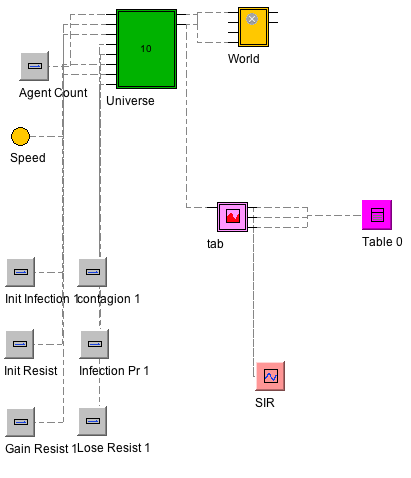 The agent-based SIR model demonstrates a simple protocol for the spread of a disease through a population. Each individual may be in one of three states: susceptible, infected, or resistant. In the academic literature such a model is sometimes referred to as the SIR model for epidemics. 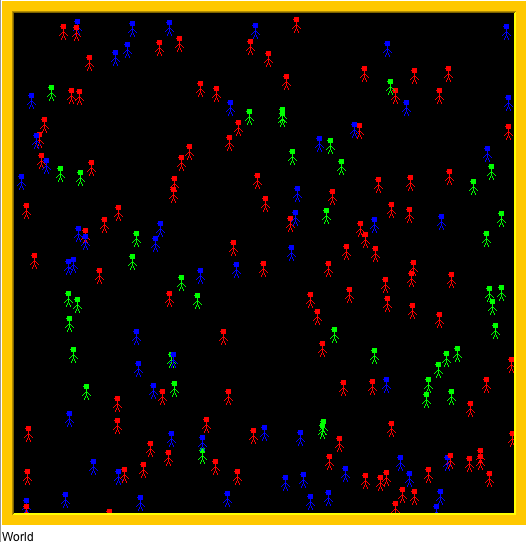 As time progresses the individuals wander randomly through the population (individuals wandering off of one edge return on the opposite edge). At the end of each time step (tick), if a susceptable individual (colored green) is within a given radius of an infected individual (colored red), the susceptable individuual will be infected with a probability given by the INFECTION-PR-1 slider. Resistant individuals (colored blue) cannot be infected. When an individual is infected, there is a probability that it will recover and become immediately resistant (given by the GAIN-RESIST-1 slider). A resistant individual may become susceptable at any time (with probability given by the LOSE-RESIST-1 slider). The INIT-INFECTION-1 slider controls the probabilistic percentage of individuals that are initially infected. The INIT-RESIST slider controls the probabilistic percentage of individuals that are initially resistant. The controls are initially set to achieve an equilibrium. INIT-INFECTION-1 Percentage of infected individuals at startup. INIT-RESIST Percentage of resistant individuals at startup. GAIN-RESIST-1 Probability that an infected individual recovers and becomes resistant. LOSE-RESIST-1 Probability that a resistant individual becomes susceptable.